Wouldn’t it be nice to be held tight, wrapped in a soft soothing cocoon, allowing you to drift away from the stress and pressures of modern living? Dr. Hauschka have recognised this innate human desire to feel comforted and safe by combining natural calming extracts to create their wonderfully therapeutic Moor Lavender Body Oil. Acting almost as an invisible veil, this organic oil works to shield sensitive souls, anyone travelling, and those just needing to unwind, from the hectic and often overwhelming world we live in today. 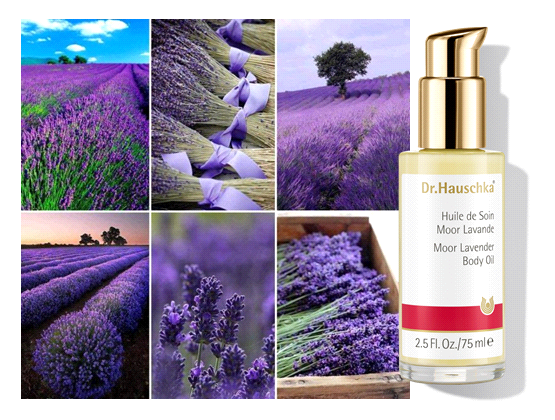 Dr. Hauschka’s Moor Lavender Oil is a thick and creamy two-phase formulation which envelopes and warms the skin. Moor extract is prepared in a special rhythmic process, producing a healing energy which helps keep oneself grounded, clear headed, and protected from the negativities and influences of the outside world. This is then combined with the gentle essence of lavender which emits a calming energy, and helps to alleviate muscle and joint pain. Together they form both a nostalgic and protective blend. If you live a busy lifestyle, are a sensitive person, or suffer from pain, then I would definitely recommend Dr. Hauschka’s Moor Lavender Body Oil. Providing relief on both the mental and physical levels, it is the perfect pick-me-up when the world is getting you down.